Hey there, meet Mellow Yellow, our sun-kissed, absolute joy of a campervan. 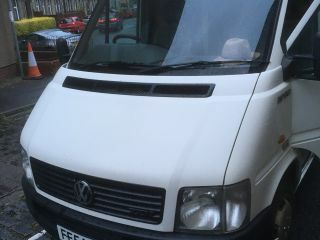 This sturdy little camper has been custom made for people looking to connect with Scotland up close in a swift and hassle free fashion. You drive Mellow Yellow effortlessly to each and every outpost of Scotland in this Volkswagen lt35 which is the (nearly) identical twin of Marshmallow (also on this site). Mellow Yellow's living quarters are compact but highly organised so everything is within hand reach. There is a little two pit gas stove and a grill underneath, pots and pans in the overhead cupboard and we generally keep condiments that guests leave behind in there as well. That way you probably won't have to buy items like sugar, tea, mayo and the like. The cool box under the bed keeps your food cool with ice packs. We have a bike rack in case you need it. There is also a shower that can be used outside the camper and which is pump-and-spray. 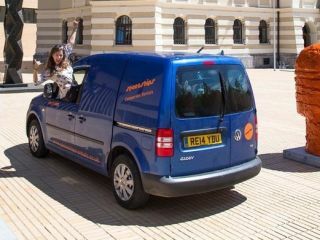 The van handles like a dream and there is a stereo radio/cd player as well as an aux facility so you can play your own music via the car speakers. Bring your own aux cable to plug in the 3mm jack and also bring your own phone holder. There are various USB ports for charging your devices powered by a separate leisure battery which itself is powered by driving the camper. Winter camping in Mellow Yellow can be done (my campers were booked up during the last two winters and guests came back raving) as it's well-insulated. The reality of winter road tripping is that at night you won't be cold in the bed. There is a tent heater too, but you'd be best off huddling around a warm fire in a pub (think apres ski) during the evenings and then diving straight into bed with a hot water bottle and a woolly hat when you are ready to sleep.